The government’s minister for Food has been urging us to eat our left-overs and pay more attention to how we store food to keep it longer. He says that during these times when most people’s budgets are squeezed, due to depressed wages and rising prices since the start of the financial crisis, we should adopt a more frugal approach to our food waste. I don’t particularly like, or trust, when government ministers start micro-managing our lives, even if it is good advice. I find it all just a bit patronising really. I saw his comments as nannying and called it ‘humiliating.’ I may have over reacted, but my assertion was that families were already cutting costs by choosing cheaper foods and that people on tight budgets were not going to waste food. But I decided to look into this matter further. Brown’s implicit assertion that unnecessary food demand (ie: waste) was causing high food prices is really quite a peculiar in many ways. As this chart from BBC News shows, 2008 saw an unusually high peak in food prices which ‘corrected’ back to the average by around March 2009. That he attributed the high price to high demand fits within his economic paradigm as a ‘supply side’ economist, but that it was attributable to ‘waste’ is debatable seen as it would be hard to show that the price ‘correction’ was because of reduced demand due to tackling waste. Just to confuse matters, the “Love Food, Hate Waste” website states that household food waste is around 7.2 million tonnes. (I presume that the Telegraph is just incompetent.) More shocking still, household food and drink waste is reported as being only 49% of the total that is wasted in the UK. The website says that 3.2 million tonnes is wasted just in the manufacturing and processing of food! I was struck by the close similarity in the 2008 and current stated values of the discarded food, having risen by about 14%, and yet the quantity had risen by nearly 60%. So, using an inflation calculator, I worked out that the current discarded food value figure was probably achieved by taking a crude rounding of the 2008 value after adjusting for inflation. (According to This is Money, inflation from 2008 to 2012 is probably somewhere between 12.6% and 16%.) 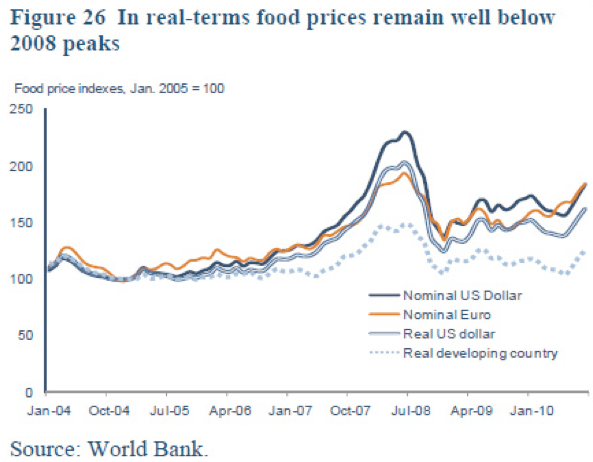 As we can see from the volatility in the world food prices between the summer of 2008 and now, employing such a straight calculation of 2008’s discarded food values in to today’s values would not be realistic at all. As for the increase in the quantity of food discarded by households, this could be accounted for by either an increase in purchases or an increase in household, by 60%. That’s a lot. According to the Office for National Statistics, in 2012 there were 26.4 million households in the UK. [http://www.ons.gov.uk/ons/dcp171778_284823.pdf] up from 25.0 million households in 2008, a rise of only around 3%. [www.ons.gov.uk/…/social-trends-41—household-and-families.pdf] So, the rise in waste isn’t due to an increase in the number of households. Figures were not so easy to find on food demand over the last 5 years, but it is probably safe to say that the quantities in weight have not gone up by 60%. How have these figures been calculated and what are their source? A 2011 study by the Swedish Institute for Food and Biotechnology (SIK) attempted to quantify food losses and wastes. They modeled the quantification based on “available data and [there own] assumptions,” providing the model equations in the annex of that document (if you want to check their working out.) SIK calculated the per capita food wasted by consumers was around 95-115kg per year by Europeans. Taking the upper bound of that figure and multiplying by the estimated population of the UK you get – did you guess? – around 7.2 million tonnes. A DEFRA press release in 2008 stated, “WRAP studies issued in 2007 found that UK households create 6.7 million tonnes of food waste each year, some 19 per cent of municipal waste. This figure means that we are throwing away one third of the food we buy (16.5 kg\hh\wk bought – 5.2 kg\hh\wk thrown away.” This appears to be at variance with the amount of waste reported by the Guardian and others in 2008, but compares better with the SIK study from 2011. These are still astonishing numbers. The SIK study works out at around between 260g and 315g waste per day per person. That seems a lot. The DEFRA study seems to suggest around 290g per person per day. So, despite my annoyance at this issue being pointed out by the government, when I’d much prefer they did something about jobs, growth and the crisis in capitalism, I have to swallow my pride and admit (damn it) – there does seem to be an issue in the UK with households wasting food. Since writing this blog entry, the other newspapers have picked up on the story with negative and bemused responses from all outlets. The prime minister has said that the information has been taken out of context, and that it doesn’t look good. It gets worse though. Many people in the media and on Twitter have pointed out that the Tory MP, who has accused the very poorest families of “wasting” to much food, has a personal fortune of £110 million! I’ve thought more about this too. Have the researchers from DEFRA taken in to account standard food wastage from the parts that either can’t or don’t normally get eaten? For potatoes peelings, carrots peeling and topping, oranges peel, apple cores, the odd rotten whatever, because no matter how hard you try to look after fruit, veg, bread, it happens. How about tea bags? And of course, the parts of food you can’t eat when preping, such as the eye of the lettuce, the base of cauliflower, fat off the chop, and bones of the turkey? Whilst we all need to be less wasteful, in all areas of our consumption and not just food, I generally believe that most people really do try their best not to waste food. I know I’m just going to keep an eye on it myself.